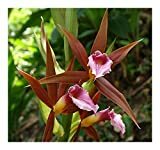 Phaius growing orchid herbaceous of the genus Phaius also known as Nun’s Orchid or Nun Orchid, Phaius perennial evergreen used as ornamental cut flower plant, can grow in tropics, subtropics, mediterranean climate or as houseplant and growing in hardiness zone 10+. Leaves color in green in linear shape, the leaves grow on little stems. Flower color can be: red, yellow, white, orange, purple, maroon, brown, pink mostly more than one color with spots, dots, stripes, flowers with five narrow linear with pointed top petals and the in the middle like a trumpet with decoration, flower can survive one month. 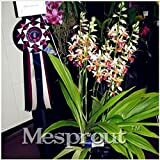 Trumpet with decoration flowers with five narrow linear with pointed top petals, flower can survive one month, color can be: red, yellow, white, orange, purple, maroon, brown, pink mostly more than one color with spots, dots, stripes.